NASA scientists and engineers are hard at work developing the technology that will be necessary for future human missions to Mars. Are you ready for Mars? NASA is working to get the agency ready for a human mission to the Red Planet in a few decades, and is showcasing its personnel and projects online. Among NASA's many spotlights is a fascinating new video that zooms in on a NASA power system engineer's quest to create enough electricity to power a Mars base. You can see Space.com's full coverage on "The Martian" here. These are some of the stories of the people working on Mars mission planning, as described on www.nasa.gov/realmartians. To Alleyne, the International Space Station showcases many different kinds of research, ranging from biology to physics to Earth and space science. One key aspect of it shows how the human body changes when it is in microgravity for months at a time. The space station is also a forum for international partnerships on science management, which will be needed for a mission to Mars. One of Bowers' projects is a prototype Martian aircraft called Prandtl-m, or Preliminary Research Aerodynamic Design to Land on Mars. The prototype is designed to be released from a high-altitude balloon to test the airplane's aerodynamic performance at a Martian-like altitude. This spacecraft prototype features an inflatable decelerator on the capsule, as well as a big, traditional parachute, to slow a spacecraft entering the thin Martian atmosphere. If the system works as planned, it will allow access to elevations on Mars that were not available to spacecraft before. LDSD testing has happened at 200,000 feet above Earth to simulate Mars. 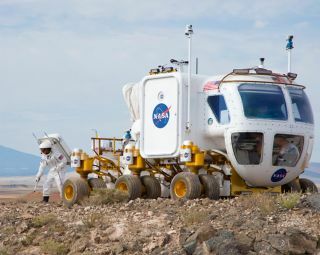 Additionally, tests have been run on the ground with a rocket-powered sled — a new tech for NASA. Day is the creator of a Web-based portal called Mars Trek, which gives both mission planners and the general public a high-definition view of the Martian surface. Among other uses, the tool is being deployed to figure out the best site to land the Mars 2020 rover. It also will chart possible locations for future human landing sites. Science fiction is important to Green in helping to understand science, because it shows how people think and how to leverage current knowledge of Mars to support a story. And there have been changes since "The Martian" was written, he points out. There's more humidity in the atmosphere than scientists knew about before the book was written, providing more opportunities to access water. And with the discovery of nitrogen products on Mars, it's possible to produce fertilizer. One of Lavery's projects is to figure out the best way to return a sample of the Martian soil back to Earth. This includes challenges such as how to pick the sample up, wrap it in a protective container and transport it to Earth — using a rocket that launches from another planet with no human involvement. The sample, once returned, could point to hazards for humans on the Martian surface. Lugo is working on simulating the trajectory for NASA's Space Launch System, a rocket that is supposed to bring astronauts across the solar system. Right now he is trying to figure out where the rocket would go during the first Earth-to-moon mission using SLS, from launch to the spacecraft landing by itself at the end of the mission. Kelly, who is doing a one-year mission on ISS, says his mission is simulating the journey to Mars involving, for example, the performance of the life support system. But there will be key differences, such as the fact that the spacecraft will be in sunlight the entire time. Lindgren says one lesson he learned on his first spaceflight is that the human brain can adapt to many circumstances. And Dyson, an advisor on "The Martian," says the key to success on a long mission is faith, hope and flexibility when you need to go outside the mission plan. Norman is part of the space radiation group, which looks at the effects of radiation on vehicles, habitats and most especially the human body. As part of this, the Curiosity rover's Radiation Assessment Detector gives investigators information on the space radiation environment on the surface of Mars. Pruitt is on the team in charge of the urine processor on the International Space Station, which converts sweat and urine into drinkable water for the astronauts. She also monitors the oxygen generator, which splits water into its hydrogen and oxygen molecules to keep the right amount of oxygen in the air they breathe. Her goal, she says, is to keep the astronauts happy and healthy for long-duration missions — just like a Mars mission would have to do. The SAM instrument aboard Curiosity has provided a wealth of information about the atmosphere that we didn't know before. For example, SAM has found nitrates — a biologically and chemically available source of nitrogen that nature uses for life-friendly processes such as building amino acids and nucleobases. International Space Station astronauts currently use a 35-year-old spacesuit that was developed for use on the shuttle. While it works well in microgravity, a Mars spacesuit will need to be more flexible, allowing the astronauts to bend over and pick up things. Watts is part of a team that is taking advantage of newer technology created in the past four decades to develop cutting-edge spacesuits and support systems that could protect humans visiting the Red Planet.